JSI conducts risk assessments with local, regional, and state-level partners to examine risks to the health care, behavioral health, and public health systems. JSI works with clients to design and conduct risk assessments that meet CDC and ASPR requirements for hazard vulnerability assessments and facilitates action to address gaps identified via assessments. 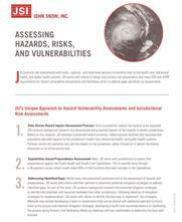 This document highlights JSI's approach to hazard vulnerability assessments and jurisdictional risk assessments using data-driven hazard impact assessment process, capabilities-based preparedness assessments, and addressing identified gaps. JSI, 2018.